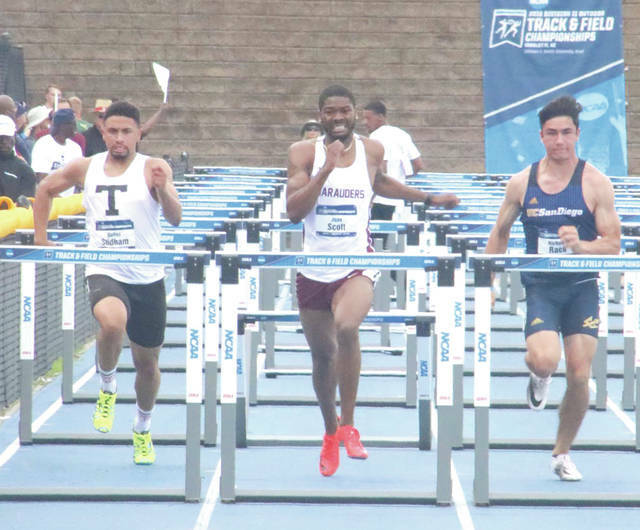 BALTIMORE, Md.— Central State University hurdler Juan Scott was named Male Athlete of the Year by HBCU Digest on June 22. Scott, a sophomore hurdler from Dayton, was undefeated in the indoor 60-meter hurdles this past season, culminating with an NCAA Division II national title in March. In the outdoor season, Scott tallied three victories, finished sixth at nationals in the 110-meter hurdles and earned All-American honors. Scott was among five finalists considered for the award. Other nominees included Trenton Cannon (Virginia State University), Amir Hall (Bowie State University) and Maximilian Kuester (Hampton University). CSU’s College of Business was also recognized by the HBCU Digest as this year’s Best Business Program. HBCU Digest is a national publication dedicated to covering Historically Black Colleges and Universities. It serves as the presenting organization of the original HBCU Awards, which annually recognizes the best in leadership, athletics, academics and student achievement from black colleges throughout the country. The 2018 HBCU Digest Awards were held at the Renaissance Harborplace Hotel in Baltimore, Md.